The collapse of the Republicans’ health-care bill on Friday certainly doesn’t spell the end of President Trump’s efforts to muck with Obamacare. Under pressure from the far-right wing of their base, Paul Ryan and other GOP leaders have already vowed to give repeal-and-replace another go, even if party members still can’t agree on what kinds of reforms they want. In the meantime, Trump and his new Secretary of Health and Human Services, Tom Price, may well use Executive power to dismantle Obamacare piece by piece. 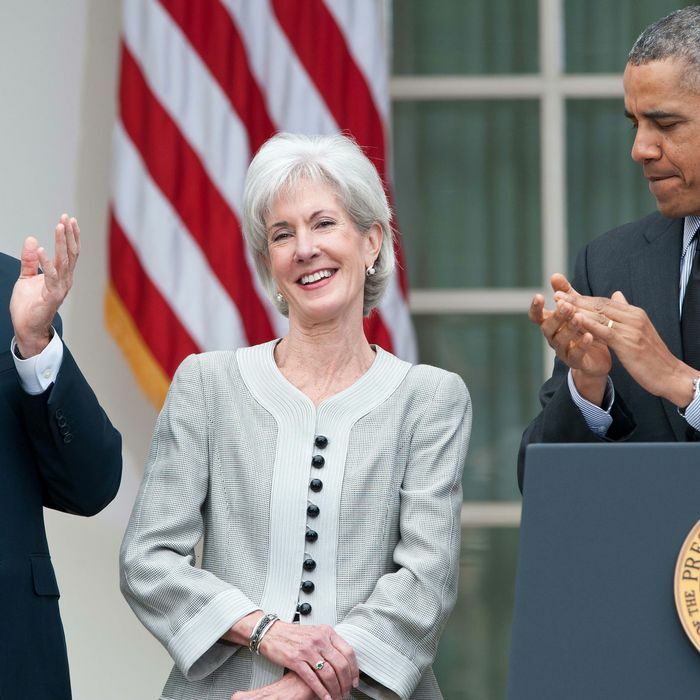 Likely no one understands better how the cabinet secretary might go about reshaping American health care than Kathleen Sebelius, who from 2009 to 2014 held the job Price now holds. Under President Obama, she helped implement Obamacare, including the much maligned rollout of Healthcare.gov — which ultimately contributed to her resignation. She spoke to us this week from Kansas, where she once served as governor and now works as a consultant. What could Tom Price do, without the involvement of Congress, to alter or even dismantle Obamacare? The secretary actually already has a good deal of authority within the confines of the Affordable Care Act. Step one really is a question of whether or not HHS will continue to reimburse insurance companies for cost-sharing expenses. The way the law is written, people who are under 250 percent of poverty, who have a marketplace plan, also are eligible to have some of their deductible and co-pay expenses paid through cost-sharing. Insurance companies basically front the money and are reimbursed by the federal government, by HHS. Republican House members, including Tom Price, when he was still in the Republican House, sued HHS, suggesting that payment to insurance companies for cost-sharing exceeded the authority of HHS. That case was basically withdrawn when President Trump was elected, in hopes that the Affordable Care Act would be repealed — but we’re back to the law. But now the lawsuit doesn’t matter, because the Republicans can simply cut off the reimbursements without the courts’ involvement? Correct. They can just stop paying. So one question companies will have is whether they will be reimbursed for those costs. If not, it could cause a number of companies now offering plans in the marketplace to not sign up again for 2018. They don’t want to be suddenly faced with a billion dollars’ worth of costs that aren’t going to be reimbursed. Companies have to make a decision this spring. In many states you have to start the filing process for 2018 as early as April. Another question is: Administratively, will the current HHS secretary do anything to encourage more companies to participate in the market? Particularly in states where there is limited competition? They can do a lot: They can use the powers of persuasion; they can get the president involved, which we used to do; they can figure out incentives for companies; or they could do nothing and allow some of those marketplaces to become even less competitive. HHS currently runs the entire framework: the website, the call centers, the outreach and education program for Healthcare.gov, which is actually the platform for shopping that is used by 37 states. Again, are they going to continue to update and improve the website? Are they going to hire enough people to actually staff the website? Will they run call centers? Will they have people on the ground to help with outreach education and enrollment? That all is within the administrative authority of the department, but it impacts about two-thirds of the states in the country. Those are decisions that have to be made very quickly and could have a big impact. You know, I’m a former insurance regulator. What companies really want and need is some clarity about what the rules are. Then they can make a business determination about whether or not this makes sense for their portfolio. I would say right now there is no clarity about what is likely to happen, about whether or not they can count on the law being in place for a while, whether it’s likely to change. It’s a whole atmosphere of uncertainty that could accelerate market collapse here. After the GOP plan failed last week, Trump tweeted that the Democrats will be ready to bargain with him “as soon as Obamacare folds,” which he predicted would happen in the near future. It sounds like the Republicans could hasten its demise if they want. Do you see any political advantage in doing that? I frankly don’t understand what the goal has been all along. It is one of the issues that was difficult to discern by reading the Republicans’ bill. Is the goal to reduce the amount of money that the federal government spends on health care, in both Medicaid and the marketplaces? That succeeded on one hand, but on the other hand, you had a lot of people who then lacked coverage, and they were willing to put money back in. Is it to get rid of the taxes on folks, which then provides the capital to pay for the subsidy? The notion that continues to be put forward by members of Congress and by the president is, ‘This is a disaster. It’s exploding. It’s imploding. It’s going to fall apart.” But I don’t understand a scenario where this is beneficial to them, because it jeopardizes the individuals who have already purchased coverage, and also the insurance companies, which bear significant financial risk with their portfolios now in jeopardy. The rest of the insurance market in the states is very much at risk if these plans don’t work. For that matter, so are hospitals and doctors, who have customers who will suddenly be faced with a lot of unpaid bills. Who gets blamed, who tries to blame whom, is less relevant than 12 million people losing their health care, as far as I’m concerned. A sixth of our economy is involved in health care, so if you begin to have hospitals jeopardized by unpaid bills, if you have doctors who can’t get paid, if you have drug companies that have people suddenly drop their medications because they can’t any longer afford a prescription, that has a big domino effect on the economies in those various areas. It also affects the insurance companies themselves, and all the patients and their families. There will be a lot of ramifications throughout the economy if this all just collapses. What reforms do you think Obamacare needs most right now?There’s no question that in some of the markets, in some of the parts of the country, there is not enough competition, not enough insurance-company participation. In many of those parts of the country, that was true before the Affordable Care Act, in the individual market, and it continues to be true. There’s a portion of the House bill that I think they called the State Stabilization Fund, where money would be essentially given to states to do anything from reinsurance pools, to incentives to companies to participate. I think that’s a great idea. I think that should be funded and pushed. Insurance is regulated at the state level, and I think that’s where states know their markets well. They know the companies who have the capacity to participate, and they can figure out what the issues are in that state that would encourage more companies to be in the market. That’s step one: more competition, more companies. I think there’s a very legitimate issue with the subsidies, and a question about whether or not the income levels that allows people to qualify for tax incentives and financial help paying for their own premiums, are set at the right level. There are lots of people who say, “I’m just over on the other side, I can’t afford this premium.” The vast majority of people who actually have marketplace coverage, about 80 percent of them, saw no premium increase even though the rates went up, because their subsidies also rose along with the premiums. The consumers in many of the cases were fine. The people outside of that subsidy category are the ones who legitimately say, “Wait a minute. This doesn’t work for me. It’s way too expensive.” I think that again is an issue that can be addressed by reexamining the subsidy level. It’s really a substitute for an employer paying a share of your insurance coverage, which 180 million people have in their workplace. These are folks who are actually paying 100 percent of the cost themselves. Also, the Affordable Care Act has caps on out-of-pocket costs, and they may still be too high. That can be solved and resolved by some additional assistance. I definitely think Congress should move into the drug-pricing area, and at a minimum, in whatever health-care bill comes next, look at Medicare negotiating authority. Medicare is the largest purchaser of drugs in the United States, and they are banned by law from negotiating for price, which doesn’t make a lot of sense. The whole idea of single-payer health care is to give the government that kind of bargaining power, right? You bet — and right now they are prohibited. President Obama tried to get that in the Affordable Care Act in 2010. There wasn’t enough Democratic support to put it in the bill. I think those days have changed. I think a bill would be widely supported, in a bipartisan fashion, now. There’s also a question of whether or not the tax penalty as written is an appropriate way to encourage young and healthy people to begin to purchase health insurance, or whether there should be a different level of a plan that they could have — a skinnier package, if you will, of benefits, that may be priced at a lower level. I think new strategies for how to have a broad-based risk pool need to be on the table, and price is arguably one of them. My understanding is that the 2017 enrollment, which had about 12.2 million people, has a pretty healthy mix. I think about 36 percent of those folks who signed up are under 35. That’s a good number. But how to continue that, how to make sure that you don’t just have older and sicker people purchasing coverage, is an ongoing concern. That’s an area that should be examined. Those are all doable, fixable issues. I like to talk about supporting and sustaining the Affordable Care Act, as opposed to “repeal and replace.” I think the framework saying, “Everybody should have coverage; what’s the cheapest, best way to do it? How do we bring costs down for everybody?” is a very valuable discussion and one that would lend itself to the bipartisan effort. If the framework starts with, “Let’s scrap everything we have, let some people have the coverage and then see how we can fill the gap” — I think that is a much more difficult approach that is unlikely to get people to the table. However, it sounds as though you’re a little more concerned about what’s going to happen over the next six months or year than you are the whole term of the presidency. Well, if some decisions aren’t made pretty quickly that stabilize the market and actually encourage more competition for 2018, I think you may see, sooner rather than later, a market collapse. In general, most economists believe that this is not a market currently that is in a so-called death spiral. It’s fragile in some parts of the country, but there’s good competition and good rates in other parts of the country. There are still 12 million people who have signed up with a good rate mix. None of that says this is a program that will fall apart. But if the administration actually, intentionally wants it to fall apart, then it could happen.